Banner Saga 3 is the third in a long story about war, the strength of people, and impending doom. This doesn’t sound like the games I usually cover, but I gotta tell you. I love the Banner Saga story, and I think everyone should take a shot at this tactical survival game. Stoic has been working on the series and released Banner Saga 3 this July. Hopefully, you have had a chance to check this one out, because just a few weeks ago, they released the survival mode, which completes the game. Well, the Banner Saga story is a bit of a long one. See title. Saga was not an understatement. In the third installment, the story has shifted from traverse and survive to the actual end of the world as the darkness swarms towards you and literally the whole world is just falling apart. Survival is still a key attribute to the story, but it’s less about you and your caravan, and more about the world itself. How will you survive and who will steer the fate of the entire world? You can get a lot out of the game by having played the other two before, but you can also just work with the most recent installment too. The story is just much better as a complete set. Banner Saga 3 is similar to it’s predecessors with some improvements to the actual battle and environments. You battle using turn-based strategy and you control a company of your caravan. Your caravan changes as the game progresses, so there are a lot of different characters with different strengths and weaknesses to choose from. They may leave, be replaced, or come back over time. The battle system is fresh because you are forced to think about who is going to be on your team frequently. You can also level up and buff your characters with the use of items. More battles means more items. One nice thing about the Banner Saga games is that you can import your saved completed games from before. 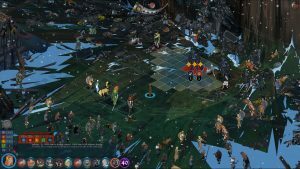 So, if you finished Banner Saga 2 with maxed out characters, you can import them to Banner Saga 3 and continue to build them there. One thing that has changed a bit from Banner Saga 2 is that the environment can change. For example, fire now spreads, adding a layer of difficulty as you attempt to avoid the flames or push your enemies to it. It makes you consider positions and adds another element that you need to consider as your strategize. One of the major reasons this game has taken six years to complete is because the artwork is amazing. Characters are hand drawn and backgrounds and environments match the details. At times it looks like I’m reading a graphic novel. There isn’t a ton of animation outside of battle. But it is still a breathtaking sight as you watch the world cascade into darkness. Survival mode wasn’t guaranteed at release. Stoic added it this September. Survival mode is less about the story and more about the tactical strategy gameplay. It feels like a tournament mode where you can fight battles without a heavy story component. Don’t get me wrong, the story in Banner Saga is probably the best part of the game, but for added replay value and for people who just prefer the battle gameplay, this is an awesome feature. Banner Saga 3 is available on Steam for PC and Mac. You can also find it for Nintendo Switch, PS4, and Xbox One. Special hint for you Nintendo Switch users: if you haven’t played all of the games yet, they also just released all three in one game called Banner Saga Trilogy. For more articles on new indie games, subscribe to the Indie Pearls weekly newsletter or follow us on Facebook or Twitter!